It's been eight years since The Strokes last performed in Canada, and judging by the ardent fanbase that greeted Julian Casablancas and his new band the Voidz at the Théâtre Corona on Saturday night (November 22), his presence was sorely missed. The second the lights started to dim the crowd were already louder than they had been throughout the preceding two opening sets, and as Casablancas waltzed out like a rockstar, they proceeded to go certifiably nuts. 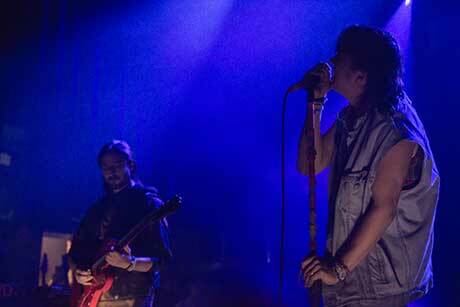 The set naturally favoured material off Julian Casablancas + The Voidz' debut album Tyranny, kicking off with album highlight "Xerox," which while alien to most of the people in attendance, still managed to get people moving. Because Tyranny favoured a particularly fuzzy aesthetic, and it could have translated poorly to a live setting, but the backing band were up to the challenge, performing all the material faithfully and with great fervour. If anything, Casablancas was the weakest link, letting the others do most of the heavy lifting and barely registering a presence at times; the vocal manipulations of his microphone did not help, as it blurred his lyrics and words beyond recognition. Opening act Shabazz Palaces' Ishmael Butler was invited back to the stage to assist on the tropically tinged "Father Electricity," complete with maracas, and took over most of the vocal duties. Fans seemed to think that jumping on stage was part of the show as this happened more than once throughout the set, with people crowd surfing over to the stage to simply "whoop!" and run backstage. By the time Casablancas and his five-piece band launched into a cover of the Strokes' "Ize Of The World," it was clear most people in attendance weren't really interested in Casablancas' newest incarnation, but were just excited at the prospect of seeing the Strokes' frontman in the flesh. The first opening slot was handled by Brooklyn punk band Cerebral Ballzy, who offered up a spastic and thoroughly engaging set, one that saw lead singer Honor Titus twitch, jump and spit his way through their material. Given the chance, they would've stayed on stage much longer, with the lights coming up before they performed their last track. Following Cerebral Ballzy was experimental hip-hop duo Shabazz Palaces, who managed to fill out the Théâtre Corona significantly. Taking place behind their drum pads, synthesizers, bongo drums and beat machines, Ishmael Butler and Tendai Maraire, clad in sunglasses and offering up a bit of synchronized posing, launched immediately into a career-spanning set, one that was somewhat slight on material from their critically acclaimed new album, Lese Majesty. The night made for an eclectic mix, with the wide-ranging lineup covering many bases. It somehow managed to all work together, given each member's inherent uniqueness, and ultimately seemed to please most of the people in attendance.